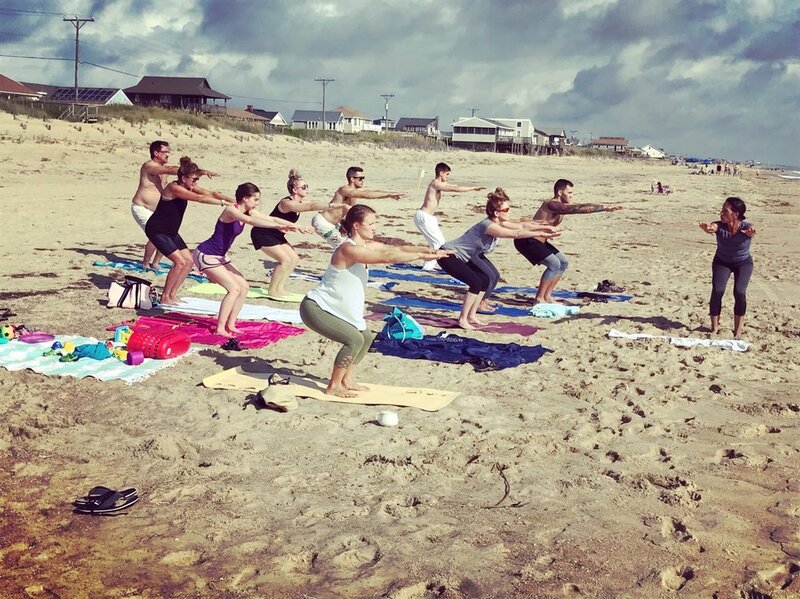 Teaching a beach yoga class last summer. Use it or lose it is so true. If you’ve lost any range of motion, get it back with a lot more movement in your day. Try this routine before your next walk! When you engage in any form of exercise you want your body to be as balanced as possible. When your body is in balance it can move evenly and symmetrically. Symmetrical movement ensures that your weight is distributed evenly and makes it less likely that you'll become injured or plagued by pain. For me, some of this stiffness was the result of needing to physically detoxify my body. But often, lack of motion on a daily basis leads to dysfunction and pain. And when you throw in all the sitting we do, and the wearing of shoes, you can begin to understand why one starts to hurt. I have had desk jobs all my life, and quickly learned that if I don’t take motion breaks frequently, it’s like saying goodbye to my range of motion bit by bit. On this site you can read about the movement therapies I’ve gravitated towards over the years. They include Egoscue, Original Strength, Qigong, Activated Isolated Stretching, yoga, rebounding, and running barefoot. With a spinal fusion, I have found the less impact the better when it comes to aerobic conditioning (and hot yoga is one of my favorites for that). I can’t recommend this book highly enough! It has exercises for each area of the body that’s hurting. I think Pete Egoscue’s Pain Free book should be required reading for everyone who wants ease of mobility. This book is one of my movement bibles. It’s not just for pain, but for one shoulder that’s higher than the other, or tight hamstrings…you will feel straighter and taller after your menu of e-cises. Read the Amazon reviews if you’re still in doubt. Egoscue talks about ‘easy mobility,’ meaning one position to another with ease of movement, without forethought, without hesitation. You used to feel good moving around as a kid…I’m here to tell you that you can get a lot of that range of motion back! Rebounding: Exercising All My Cells!